Q: If you were told that you had to put together a mixed case of Washington wines from the '07 vintage that you could not touch for 10 years, what would be in the case? PG: Some of the top 2007s have not yet been released, so keep an eye out. Late release can be an indication of a more ageworthy wine. I’d stay with proven producers who have a track record for being ageworthy. To begin – some rieslings – Poet’s Leap and Eroica, maybe take a chance on a single vineyard riesling from Pacific Rim. The Chaleur Estate Blanc would be a good bet for a sauv blanc/sémillon blend. I’d definitely want some merlots – Quilceda Creek, Leonetti, Sineann ‘Champoux’, Abeja. Some cabernet sauvignon and Bordeaux blends – Woodward Canyon Dedication Series, Quilceda Creek, Betz ‘Père de Famille’, Soos Creek ‘Ciel du Cheval’. And a couple of syrahs – anything from Cayuse, Betz ‘La Serenne’, or the Buty Columbia Rediviva blend. 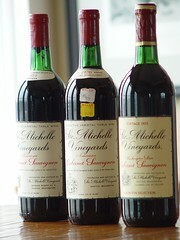 Q: The only thing you didn't speak about that I feel affects the aging of a wine is the vintage. After tasting a '97,'98, and '99 (three very different vintages) Cab Sauv side by side you can see the effects the vintage had on the wine. PG: Yes indeed, vintage variation always shows up in a vertical tasting. That’s part of the fun of them. But it’s very hard to predict how it will play out ahead of time. I do not care for vintage ratings for this very reason. PG: I always wait at least a couple of weeks after wines have been shipped to me in order to give them a chance to settle. But the initial bottle shock – from being bottled – can take much more time to resolve, especially if the wines are reductive to begin with. You’ll be able to spot bottle shock in young red wines because they are completely “dumb” – there doesn’t seem to be anything there, yet the color, density, alcohol levels etc. tell you there is something there. Q: One item I didn't see noted is, wine is made so different now. All you have to do is acquire a lab book from any of the large labs out there. The technology and chemistry world has changed so much in the past 10 years, even the past 5 years, you would be amazed. There are some very well made wines out there that will age well, but few in my opinion. PG: I agree absolutely. It’s always better to drink a wine too soon rather than too late, unless you know for sure you like older wines that may be on the downhill slide. My quick rule of thumb: buy at least four bottles of any wine you plan to age. Drink one immediately. Divide the expected lifespan of the wine by the number of bottles you have left. That number is how many years until you drink the next bottle. Repeat until all the wine is consumed. Q: Given our relative youth as a winegrowing industry/region, it seems a bit early to categorically decree Washington’s wines as ageworthy. PG: I would never categorically decree anything about a region as large and varied as Washington state. But having tasted Washington wines at 20, 25, 30 or more years of age, I am confident that by most standards, it’s fair to say that there are some wineries, winemakers, and vineyards that can not only last, but evolve and improve for many years. Four years ago, I had the extreme pleasure of tasting through some exceptionally old Washington wines from Ste. Michelle and Associated Vintners. Here are links to the Seattle Times columns that I dedicated to those wines. Glad to see this topic was worth coming back to. Good call on the rieslings. It's easy to forget about them and focus an aging discussion only on reds. Also like your "rule of thumb" for monitoring wine age ability at home. Paul - good ideas. I might question the Nebbiolo - not much of a track record for ageworthiness in this state (Peter Dow would probably disagree, but that's my opinion anyway). But a good list otherwise. Anyone else want to take a shot at it? I'd just quibble a bit with Leonetti (or any) Merlot, as it has been one of my biggest disappointments in terms of ageing. Also, I wonder if Bob Betz would agree that his Syrahs can last for ten years given that he once projected 2-3 years (from release). Perhaps wine-making techniques have changed, though, as this was some time ago. I'll be looking forward to seeing other readers' top-12 lists! Here are mine. Though the Woodward Canyon is actually the only one that I have had with that much bottle age on it. I had a '75 Chateau Ste. Michelle cab about 6 months ago and was floored at how vibrant it was. Still relatively purple with fireworks of aged cedar on the nose. The palate wasn't quite as spectacular but distinct cassis and even a bit of menthol were no slouch. Almost no fading of structure or presence with the two hours that it sat in the decanter. I know these wines were made differently, but WA cab can certainly age and age with grace! Here is my 2007 mixed case of Washington wines. If anything, at least I'm predictable! Too much, too little time. throw a Tamarack Firehouse Red in there just for FUN! We have had good experience with aging Washington and Oregon wines, and I don't think that "breaking the bank" is necessary. I just finished the last of a case of 1991 CSM Late Harvest Riesling, and they were exquisite. The 2000's are still holding well. Ditto, multiple bottles of the '94 and '98 Andrew Will single vineyard Merlots (the Ciel and Klipsun in particular)were spectacular after 10+ years. Nobody mentioned Seven Hills Winery? Casey makes lower alcohol, ageworthy wines with the best of them. I was in Berns Steakhouse in Tampa and ordered a late 80's Cab that was dynamite from start to finish. And Jared, how predictable! All Cayuse...you crack me up. I'm surprised I haven't seen the Pepperbridge wines showing up on these lists. In my opinion, J-F is making some the most age-worthy wines in the state. I believe the cab he poured at Vintage Walla Walla was by far the best wine at that event. Also, based on their flavor profile, I think the Cote Bonneville wines will be drinking very well for well over 10 years. Paul - agree that the Nebbiolo is the biggest wildcard. I figured in 10 years I would want to have at least one bottle in the case that would scare me a little with its unpredictability. My 2 cents....in no particular order. 6) Pepper Bridge "Pepper Bridge Reserve"
Andy-If you haven't tried the white wines from Claar Cellars at Pasco WA. you are misssing some of the best whites from Washington state! Their reislings are oustanding and the chardonnay's are exquisite. Their winemaker is french and really understands how to make superior white wines. Also try Gordon Brothers reds-they make great reds that store for many years. I can't see the Leonetti. I haven't had one that was typical of Leonetti fruit and finesse after 8 years. I love older Woodward Canyon as well as Col Solare. I have numerous L'Ecole and Barnard Griffin Semillions stashed away as well as Kiona Riesling. Just had a 1990 Columbia Crest Cab last night. The wine was stored in a crawl space of his house in Oregon so we did not have high hopes but were very surprised how good the wine was. 13% alcohol very nice nose, seemed to have more acid then some of todays wines which I think helped the wine survive. Very nice bottle indeed! Great and interesting opinions. Lots of votes for Buty's Sem/Saub Blanc...makes me want to grab a few and see how they do. Have enjoyed a few L'Ecole Sems will some age that were lots of fun. Love Jared's list, just wish I could keep my hands off my Cayuse to see how they age, haha! I'd throw out Woodward Canyon's Artist Series as a great 10 year old wine. inspired by these posts/comments, I cracked open a Sineann 1999 Pinot Gris (Willamette Valley), bought for $12/ (case discount?) at the time. Really nice. Beautiful color, balance, long finish. Been open for a few hours now and loving how it keeps changing. No where near the downhill. Wish I had more (bottles, and wine in this last bottle). Andy, although still very young, one of the many minerally WA whites I really enjoyed this past year that I wish I had bought more of to hold onto, to see how it developed over time, was Syncline's Grüner Veltliner. Whenever we'd pick up more, just never seemed to sit for very long. Too tempting/tasty. "A very good friend of mine gave us a bottle of 1999 Hightower Cabernet Sauvignon before Christmas. I didn’t think too much about it, except to note that it was a ’99 (which was interesting) and that the person that gave us the bottle is someone whose taste in wine I trust completely. We opened the bottle a few weeks ago and I was astonished by how delicious it was. It pushed ALL my buttons – just enough fruit, earthiness, delicacy and elegant leathery, licorice notes, and a long finish. It wasn’t tired at all – it was much more European in style than most American wines, but it was unmistakably domestic. What more could a wine lover ask for? "I immediately set up a meeting with Hightower to taste through their current releases. I am happy to say that the same quality is still there that I first tasted in their wines a decade ago. We can't get you any of the 1999 vintage, but I think you will enjoy this Cabernet and Merlot very much. They are delicious right now (much bigger and fruiter than they will be when mature). These wines (especially the Cabernet) are well worth laying down for 6 to 8 years. (Possibly longer if you have excellent storage.) Where so many domestic wines fail to age and lose any semblance of balance at an early age, these wines will live and improve for many years."